I hereby declare that today is International Cyberpunk Day. *Blows party horn, which unfurls into a miniature trenchcoat and flicks rain everywhere*. Earlier today I mentioned that Satellite Reign was heading to Steam Early Access in December, and now I'm going to go on about something similar you can play in the meantime. Well, I say similar—while it might share a similar aesthetic, Read Only Memories is a cyberpunk adventure game in the Snatcher mould. The above trailer hit all the right notes for me, so I'm very much looking forward to its release in March next year. But wait a minute, didn't I say something about playing it now? Yup: there's a demo, available here. The demo contains a "final(ish) version of the game’s Prologue & Chapter 1", and it's available for Mac and Linux as well as Windows. You might know developers MidBoss as the organisers of GaymerX, and Read Only Memories seems particularly inclusive in that regard. While it's the sort of adventure game that doesn't show the player character, you'll be able to choose from a variety of personal pronouns when you start the game. 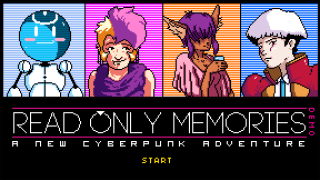 "Read Only Memories is a new cyberpunk adventure that takes place in Neo-SF, 2064. Based on 90’s point & click adventure games like Gabriel Knight and Snatcher, Read Only Memories is all about exploration and puzzle solving. The deeper you dive into the mystery of your missing friend and this new unknown ROM, the further you get entangled into the deepest scandal to ever hit Neo San Francisco. In a city packed with danger, and filled with Hybrids, Humans, ROMs and Brain Controlled Androids, the question is: Can you survive in Neo-SF?"